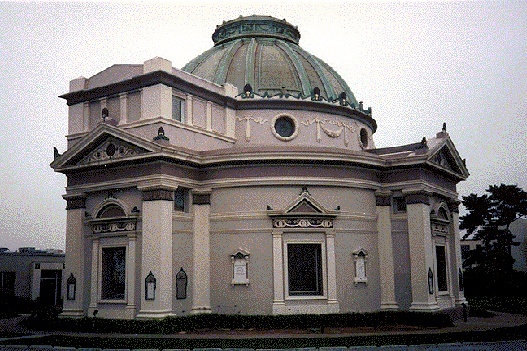 The Neptune Society Columbarium in the Richmond, 1995. The Neptune Society Columbarium lurks at the terminus of an obscure dead-end street called Lorraine Court. When you approach it on a rainy day, the tall, round shape manages to look both imposing and foreboding, like a cross between a Greco-Roman monument and a gothic haunted mansion. As you get closer, the massive stone pillars guarding the entry loom larger, appearing almost black against the dull gray sky. The wrought-iron gate is barely open, as if daring you to try and squeeze through; you half expect it to swing open for you like horror-movie doors, then slam shut behind you, the dull clang ringing out an inhuman "gotcha!" The round, domed design recalls the Roman Pantheon, which is the original template for many of the most important government buildings in the US., not the least impressive of which is San Francisco's own City Hall. The Columbarium's builders were undoubtedly aware of the Pantheon's claim to being the original home of Christianity, and knew that a design that partook of its heritage would have enough religious connotations to satisfy the faithful; while at the same time the Pantheon's non-denominational status (it was the home of all the gods, as the name suggests) and the thoroughly ecumenical tradition that has descended from it (from Les Invalides to American capitols) would please the less-than-fanatically-religious, who make up a sizable percentage of San Francisco's population. Finally, the Columbarium's classical associations point toward the equation "classical = classy," implicitly claiming that this is one classy place to stash your ash. The wrought-iron gates, carved wooden doors, and stained-glass windows all point in a radically different direction--toward the explicitly religious connotations associated with gothic architecture, a tradition that dates back to 12th-century France. (By the 17th and 18th centuries, the gothic style began to take on negative connotations: it was old-fashioned, overly pious, too-elaborate, and even grotesque. The association with grotesquerie has persisted, and even today the gothic is sometimes associated with dungeons, gargoyles, and things that go bump in the night.) Though usually the Greco-Roman and gothic styles are considered opposite poles on the architectural spectrum, the builders of the Columbarium may have tacked on the gothic frills both to make the building appear more church-like and to satisfy that 19th-century taste for neo-gothic ornamentation which is also visible in the Victorian houses of the era. Nowadays, both classical and gothic styles seem old-fashioned, and the odd blend gives the Columbarium the sort of eerie charm that can only emanate from buildings of another era. And the Columbarium is, indeed, from another era--an era when huge, sprawling cemeteries occupied much of what is now the Richmond district of San Francisco. Built in 1898, it was originally the crowning jewel of the Odd Fellows' Cemetery, which stretched from Geary Boulevard most of the way to Golden Gate Park (where it was met by another cemetery at Fulton and Arguello, whose last remains are the pair of vases at the park's Arguello Street entrance.) Between those two cemeteries and the ones at Masonic and Geary (site of the old Sears Building) and the one where Children's Hospital now stands, it seems that property owners in the Richmond began to worry that their neighborhood seemed a little too dead. In an attempt to liven things up, the City passed a 1938 law banning cemeteries from within the city limits, and many thousands of the Richmond's most stolid and law-abiding residents were unceremoniously uprooted from the ground they had so peacefully inhabited and forcibly relocated to Colma--a fate which many San Franciscans might consider worse than death. The Columbarium gradually fell into disrepair, passing from owner to owner until, in 1980, it was purchased by the Neptune Society, which had been organized a decade earlier by a group of enterprising cremation enthusiasts. Since then, the caretaker, Emmet, has done a remarkable job of restoring the place, and niches are currently available in the $4,000-$56,000 price range--not bad, considering that for that price you'd never find a condo half as spacious in any decent San Francisco neighborhood. The Columbarium's interior is rather like that of a domed neoclassical church, with its soaring overhead space and low lighting pierced by stained-glass windows that blaze colorfully even on cool gray San Francisco days. One major difference is that instead of religious art and statuary lining the walls, virtually every bit of wall space is taken up by bronze niches roughly the size of large post office boxes. Most of the niches have names engraved on the door and contain one or more urns, each of which harbors an unspecified quantity of human ash. Emmet is rightfully proud of his work, and he's more than willing to discuss the Columbarium's history with customers--rather, the survivors of customers--as well as with interested visitors. "Give 'em a little history of the place; it takes their mind off their problems," he says. "It ain't gonna erase nothing, but it'll damn sure pacify for awhile." For Emmet, the Columbarium is still the centerpiece of a vast, secret city of the dead whose borders coincide with those of the old cemeteries. Emmet knows full well that many, if not most, of the bodies in the old cemeteries were never dug up and transplanted. "There's plenty of dead folks out here," he says, gesturing beyond the limits of the Columbarium grounds toward the rows of houses between the Columbarium and Golden Gate Park. "The city ain't gonna do nothing for you for free. When they moved the cemetery, either you paid or you stayed. The ones nobody paid for stayed right there in the ground." You mean there are thousands of corpses lurking beneath the unsuspecting row houses of the Richmond? "That's right. I've found bones, caskets and cremation jars just digging a trench at the edge of the grounds, over there by the sidewalk." Naturally, Emmet wasn't the least surprised by the discovery of Gold Rush-era bodies beneath the Palace of the Legion of Honor. He discussed a recent report that a woman's seemingly well-preserved remains had been found in a glass case; but when, despite painstakingly gentle handling, the case broke as it was being removed from the ground, the form of the woman crumbled to dust. "You turn to dust anyway; that's just a slow process of cremation, except you get some help from the worms and the bugs." Though Emmet has made the Columbarium his life's work, and though he says he'd rather be cremated than try his luck with the bugs and worms, he's planning on making his home state of Louisiana the last resting place of his ashes. But for those who want to leave their hearts, and the rest of their mortal remains, in San Francisco, he'll be happy to find you a cozy little niche in the Columbarium. The Columbarium, at One Loraine Court, set on a 3.5 acre park at the entrance to the Odd Fellows Cemetery, was completed in 1898, as a memorial repository for cremated remains. Designed by the young British architect, Bernard J. S. Cahill, who specialized in mortuary architecture, the Columbarium is considered one of his finest works. The Odd Fellows regarded death as a dignified and ordinary affair, without fear or morbid feelings. The interior of the Columbarium was furnished like a Victorian parlor with potted palms and oriental rugs. The neo-classical style building blends Roman Baroque, English neoclassicism, and 19th century polychrome. The exterior has a Roman-inspired dome similar to Michaelangelo's original conception for St. Peters. The dome is copper-clad and ribbed with an inner steel framework. A squat lantern is clad in copper with round openings and decorated with garlands. The walls are stucco and grooved to simulate stone. The interior has four levels topped by a stained glass ceiling within the lantern. The dome is supported by eight Roman Doric piers. Flower and urn decorations are cast plaster. The central rotunda has four square wings. The first floor has the Greek names of the winds: Aquilo, Solanus, Eurus, Auster, Notus, Zephyrus, Olympias and Arktas. The second floor has the Greek names of the constellations: Corona, Zubanan, Cheiron, Argo, Sothis, Orion, Perseus and Kepheus. Large stained glass windows, mostly created by the California Art Glass Company, with one possibly by Louis Comfort Tiffany or John LaForge include: three angels, "The Holy Spinner," an angel with lily ascending into heaven, Christ with outstretched hands, a design often used on Easter cards, and an angel, in purple, lifting a body upwards. Following the removal of the Odd Fellows Cemetery in 1930, the Columbarium was sold to Bay Cities Cemetery Association. In 1935, the Columbarium was declared a memorial and the land was homesteaded under the Homestead Act to prevent the state from taking control. In 1980, it was sold to the Neptune Society, which undertook a $300,000 renovation. 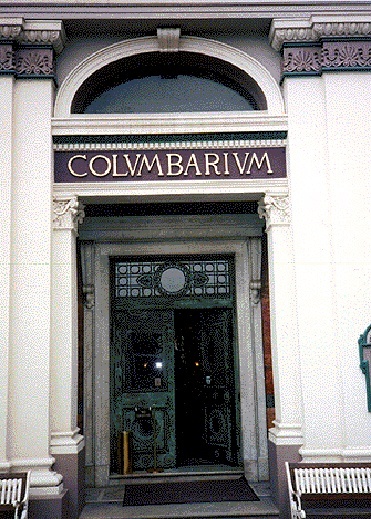 In October, 1995, the Columbarium was given landmark status. Starting in 1999, plans for expansion and renovation included tearing down the office building and building a new office building; construction of a wall with 6000 niches around the perimeter of the park, planting trees, creating a new parking lot with a quieter gravel surface; and building a new Victorian-style gate at the entrance. Niches with copper and glass doors house the ashes of prominent and less prominent residents of San Francisco reflecting the style of the era in which they died. Lined with silk drapery and containing urns of alabaster, silver, copper, and ceramic, many urns reflect the Victorian era and early 1900s. Photographs and treasured mementos reflect the latter part of the 20th century.